Take a cruise and discover all the riches that Ancient Egypt has to offer in Queen of the Nile, one of the original slot games from Aristocrat that has stood the test of time. First released way back in 1997 in its land-based form, Queen of the Nile has since made a successful leap online and, like a fine wine, it seems to get better with age. The franchise was extended with the development of Queen of the Nile II, but there is something quite charming and instantly playable about this original title in the series. 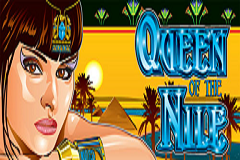 The classic Queen of the Nile set the tone for the slot game industry – both for Aristocrat and the industry as a whole – with its enjoyable gameplay mixing neatly with great graphics and sounds (which still stand the test of time to this day) and a generous bonus round. This slot game, which features 25 paylines across its 5 reels, pays out at around 94.88%, a generous enough ratio that has become the industry standard. As mentioned above, the sheer nature of the free spins bonus game ensures that your potential winnings are not capped at a low margin; great news for budget payers and high rollers alike. Players are invited to take what is hopefully going to be a profitable cruise through Ancient Egypt in Queen of the Nile, with the ultimate aim of uncovering the treasures held by the tantalising temptress Cleopatra. You’ll note that she makes an appearance on the game board as the wild symbol, and will double your payout if she features in a winning combination. And that stunning bit of Egyptian architecture that is a pyramid is also a sought after symbol as this acts as the scatter, and if you grab three of these on your five reels then it will trigger the free spins bonus round. Spin five pyramid symbols and you will instantly receive 100 free spins – a brilliant opportunity to win some serious cash! You won’t find many slot games that hand the power regarding their bonuses to the player, and this generosity has added to Queen of the Nile’s mystique as a cult slots game with incredible longevity. And, of course, you can actually trigger the free spins bonus game again by spinning three pyramids while enjoying your free spins, for double the reward. Who knows how much you could win? The Gamble feature of Queen of the Nile is a simple, yet effective, card turn. All you need to do is guess the correct colour (red or black) for a double payout, or guess the correct suit (heart, diamond, spade or club) to win four times your stake. It’s like Play Your Cards Right, just without Bruce Forsyth’s chin protruding across the screen. With hundreds upon hundreds of lost games now available online, including the latest licences and movie tie-ins, you would think an ‘old dinosaur’ like Queen of the Nile would slowly disappear due to dwindling popularity. But nothing could be further from the truth; and that is testament to its charm and generosity. Despite its slightly dated looks when compared to newer games available in the casino, what Queen of the Nile lacks in aesthetic beauty it more than makes up for in the generosity of its bonus payouts and in its simple charm. As a medium/high variance game, there is the potential for some very tasty winnings. And while the Ancient Egypt theme has been replicated elsewhere, it s fair to say that it has never been bettered since Queen of the Nile was created by those geniuses at Aristocrat almost 20 years ago. So while you can’t teach an old dog new tricks, you can enjoy what it brings to the party nonetheless.